Currently a Lecturer in Pharmaceutics at the School of Pharmacy as University College Cork. Having completed his BSc. Pharm. degree at the School of Pharmacy in Trinity College Dublin (TCD), he proceeded to a PhD. in the Pharmaceutics at TCD. After working in pharmaceutical industry for a number of years (at Élan and Servier), he returned to academia in 2005. He is also Course Director of the MSc in Pharmaceutical Technology and Quality Systems, an on line masters course designed to train graduates working in the pharmaceutical industry to become a Qualified Person (QP). 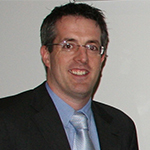 Dr. Griffin research interests focus on the development of optimised and targeted drug delivery systems. This includes lipid based formulations for enhancing oral bioavailability of poorly soluble drug compounds; design of nanoparticulate based drug delivery systems; targeted drug delivery to the brain and to the intestinal lymphatics. He continues to interact closely with the pharmaceutical industry and has a number of research collaborations with industrial partners.